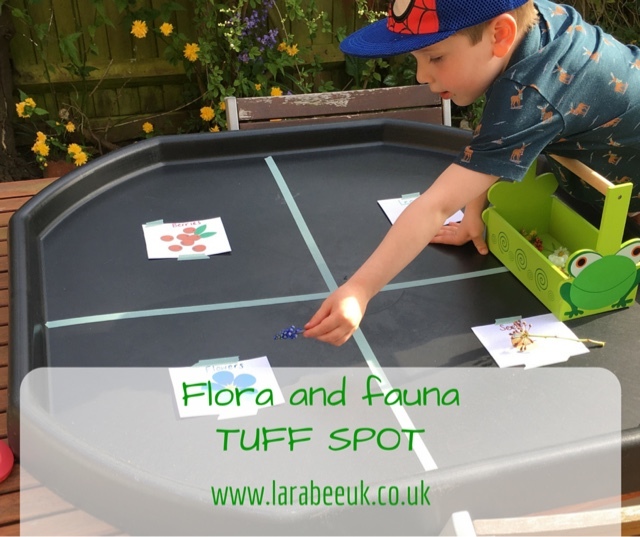 Using our tuff spot in a different way again this week, with an easy to set up gardening activity. 1. Start out by dividing the tuff spot into quarters using the Washi tape. 2. 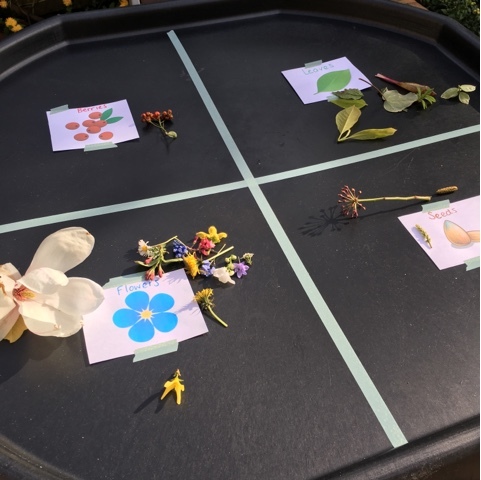 On each quarter add a plant identifier. Seed, leaf, flower and berry I printed off simple clip art pictures for mine to make it easier to T to identify, you could use pictures, photos or words depending on the age of your child. 3. 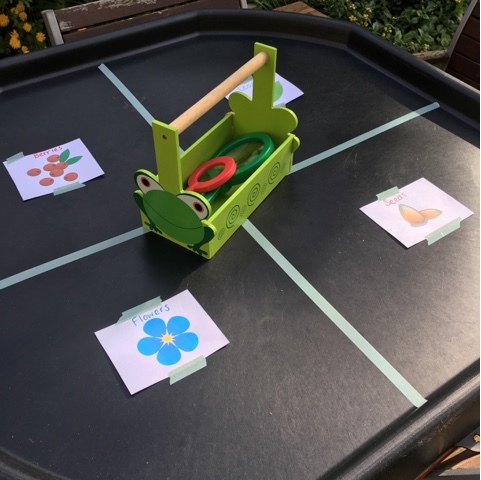 T and I then went round the garden collecting our 'specimens' he really enjoyed snipping parts of the plants off and putting them in his trug. We also got the magnifying glasses out and looked a bit more closely at everything as we went. 4. 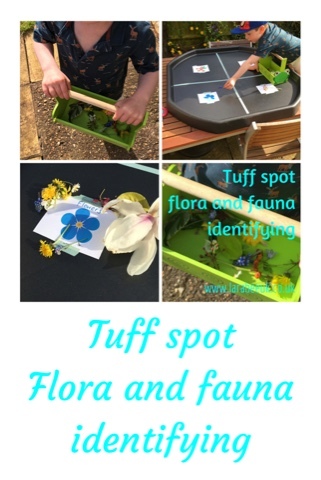 Once we had a full trug, we went back to the tuff spot and T places the items on the relevant quarter. We talked about what each was and how you could identify it. The seeds were a little scarce at this time of year, so this would be a perfect activity to do again later in the year. We enjoyed this tuff spot together, T learned a lot about plants and identifying them, he also learned about the different types of fauna, which loose their leaves and which are evergreen. This is a really interesting activity and one may attempt with my little boy! This looks like loads of fun! A great way to keep the kids entertained outdoors this summer. What a fabulous idea! It's great to find activities that will keep kids outdoors and interested in learning at the same time. 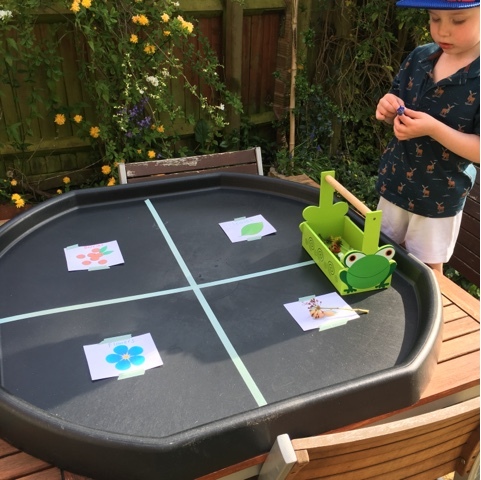 I really have to try this with my little one, he loves finding things so to make a game of it then identify them would be great!